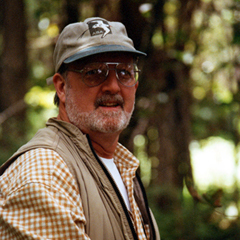 Welcome to the official website of ornithologist, musician, illustrator, author, and leading authority on the birds of Hawaii and the Pacific Islands, H. Douglas Pratt. 1) I have officially retired as of May 2012. This does not mean I am no longer working. In fact, I’m busier than ever, but now I collect Social Security! 2) My new music CD was released in June 2012. See Music section for details. I am very excited about the CD, and it is selling well for a basically amateur, though professional-quality, production. 3) In March 2013, along with co-author Jack Jeffrey, I finished a completely new and slightly retitled edition of A Pocket Guide to Hawai‘i’s Birds and Their Habitats for Mutual Publishing in Honolulu. The first edition has been a local best-seller for 17 years, and we have high hopes for the new one. Look for it on store shelves in May or June 2013. 4) My application for an NSF grant to support work on my new book was turned down in January 2012, and I did not to re-apply. Nevertheless, work is proceeding and I just signed a new contract with Princeton University Press. The new goal date for publication is 2016. If you’d like to help, see New Book. 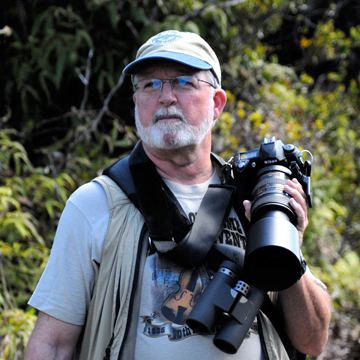 5) I led another Hawaii birding tour in February-March 2012, and have planned several tours over the next couple of years, including some destinations in North Carolina (see Travel). 6) In January 2013, I was honored to be asked to fill a vacancy on the North Carolina Bird Records Committee. 7) After a little over a year of unofficial connection with my old institution, I was officially appointed Research Curator Emeritus at the North Carolina Museum of Natural Sciences. This is an important professional affiliation for me, as it gives me use of the collections and facilities and enables me to borrow specimens for my illustration work. 8) The Pacific Birds Bibliography continues to grow, with new entries almost every week. 9) In September 2012 I was once again qualified to enter the contest for the International Autoharp Championship at Winfield, and came in second. See Music. 10) I am downsizing my personal library because I am running out of shelf space, and I realize I no longer need to keep every book I ever read or used! I have quite a few things for sale at good prices, although the list is ever-dwindling, and many more that I will gladly donate to a worthy recipient. Contact me for details. So basically, my life reflects the old saying “When one door closes, another opens.” I am currently gearing up for full-time work on the new Pacific bird book, as well as catching up on several private painting commissions. I also plan a new edition of my birdfinding guide Enjoying Birds and Other Wildlife in Hawai‘i, which is now out of print, as soon as possible, and I have several scientific papers in the pipeline. I’m also working on several new pieces for the autoharp contests when I have time. As I said, busier than ever! I hope you enjoy the refurbished website. I look forward to hearing from you, whether with complaints or compliments.